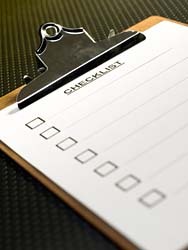 Here is your Email “Checklist to Success” for your email marketing campaigns! By now you know that email marketing is still one of the most successful ways to market on the Internet, giving you the greatest ROI (Return On Investment), while providing you with the highest possible conversion rate. Optimization Best Practices in SEO and SEM” conferences and you be emailing with success! Email marketing is not an exact science; it is an ongoing learning process. It’s all about “optimizing”. You need to continuously test to see what is working and what isn’t. If it works, keep doing it. If it doesn’t, then stop that. Do you have a low open rate? • Then take a look at your subject line. • And, no more than 5-8 words? • Does it incorporate a clear and specific WII-FM (What’s In It For Me)? • Does it look like spam? Consider your delivery day and/or time. Industry statistics suggest that recipients are more receptive to offers in the mid-day, mid-week timeframe. Remember the psychographics. Get into your customer’s head. What are they doing and when are they doing it. • What is the age of the list? • What is the list quality? • How were the names collected? • Are you providing a strong enough WII-FM? Do you have a low click-through rate? • Again, look at your WII-FM. It may not be strong enough or clear enough. • Is your copy too long? It may be keeping your WII-FM from standing out. • Stick to simple words, short phrases and paragraphs of 1-3 short sentences. • Does your WII-FM fulfill the promise of your subject line? Do you have a high Unsubscribe Opt-Out rate? • You may be over-communicating (too frequent), with your recipients. • You may be targeting poorly. Be sure you send the right WII-FM to the right people, segment properly. Here’s an email campaign checklist that you can use before you hit the “send” button to be sure your email is ready to go! Your email campaign checklist – 20 important items to consider. • Bring visitors back to visit your site or store? Remember the “Cost of Customer Acquisition”? • Prompt requests for more information? • Schedule appointments or sign up for a service? • Drive traffic to your 800 number? • Drive traffic to your retail locations (B to C and B to B)? • A segment of your customer base? • Your entire house list? • A rental list of prospects? • What are their specific interests? • What is important to them (WII-FM)? Use psychographics to determine how to describe in hot button words the WII-FM in your offer. 5. Accurately define your delivery timing. Get into the psychographics of your customer. When is your customer most likely to open and read your message? While your customers may vary, a mid-day delivery is most often better than mornings or evenings. Choosing the right day of the week is also important. Tuesday and Wednesday achieve better results than the beginning or the end of the week. Again, the psychographics say that Monday, your customers are indiscriminately emptying their inbox from the weekend. Friday, their minds are on finishing up the week and starting their weekend. 6. Does your “From:” line include your company name or brand? 7. Is your “Subject” line the right length? (5-8 words, 40 characters including spaces). 8. Does your “Subject” line incorporate a specific WII-FM? 9. Does your “Subject” line include your brand (if for some reason your “From” line does not)? 10. Does your “Subject” line use hot button words? 11. Does your “Subject” line create a sense of urgency? 12. Is your email personalized with at least the recipient’s first name, and both first and last name, if appropriate? 13. Is your email copy clear and concise? 14. Does it contain a strong definition of conversion? 15. Does it focus on the WII-FM? 16. Does it create a sense of urgency? 17. Have you used appropriate graphics that summarize the content while also making good use of white space? 18. Have you proofread the “From:” line, “Subject:” line and email copy thoroughly? 19. Have you checked all links to be sure they work properly? If you can check-off all of the above, then you’re ready to hit the send button on a very successful email marketing campaign. Please feel free to give me a call so we can schedule a day or two where I can come to your company’s location to work directly with your and your entire team. You’d be surprised how reasonable the cost is and the amazing ROI you can realize. Just give me a call so we can arrange any of the above. Remember: Both of my approved partners; Constant Contact for email Campaign Management and Top Marketing Associates for SEO/SEM, are available from my web site at www.LonSafko.com. Be sure to let them know that you are alumni of our conferences so you will get the lowest price and best service. In the mean time, have a great summer and I hope to hear from you again soon.